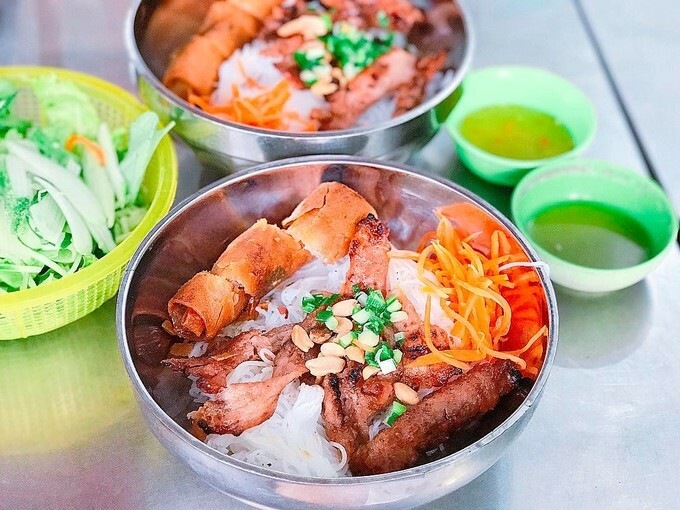 On the ground floor of an apartment building on the Nguyen Hue walking street, this eatery has been serving grilled pork with rice vermicelli (bun thit nuong) for more than half a century. 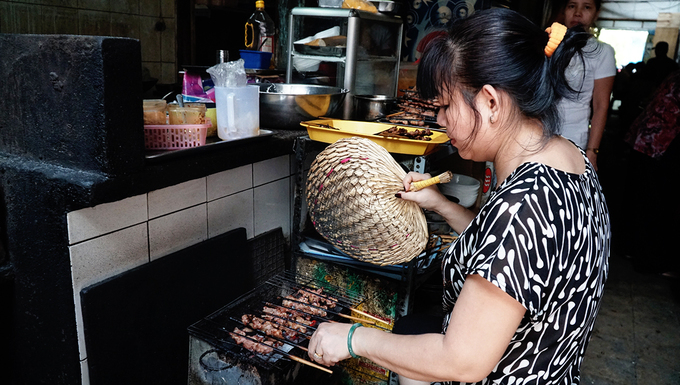 The staff of this eatery are middle-aged women, each performing her duty smoothly – one mans the main kitchen, one grills the meat, one serves the dishes and another cleans up. A small bowl of spiced fish sauce dip is an indispensable part of the dish. This eatery scores extra points for the added pungency of its dip. One serving costs VND30,000 ($1.29). Customers can order extra spring rolls or grilled pork. The restaurant serves guests from 10 a.m. to early afternoon. It also has the take away option. 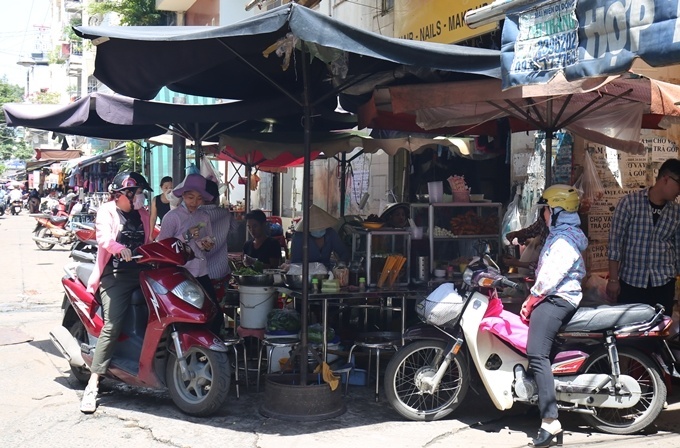 Located in Xom Chieu Market, the restaurant mainly serves local residents shopping in the market and living around the area, with very few outside visitors. 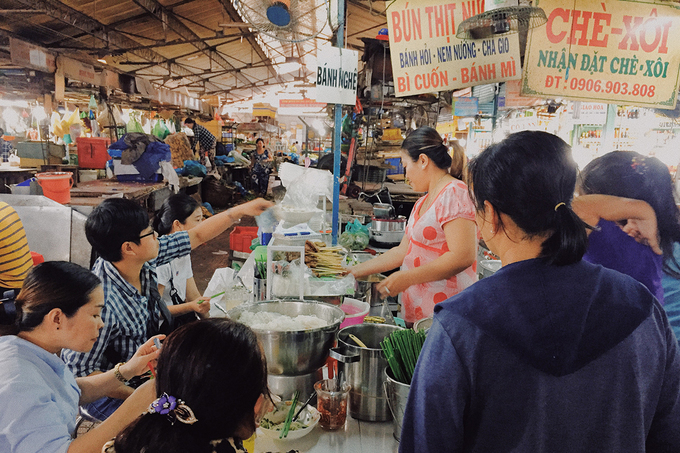 The owner says the place has been around for more than 30 years; before moving to the market, the eatery started out as a small sidewalk vendor. Each serving, which customers say is abundant, costs VND28,000 ($1.2). The grilled pork is scorched just right, well seasoned, and carries the smoky fragrance. Spring rolls are already fried, but served crisp. Beneath the soft vermicelli noodles are just chopped vegetables. The highlight is the shiny layer of fatty onion with peanuts on top. 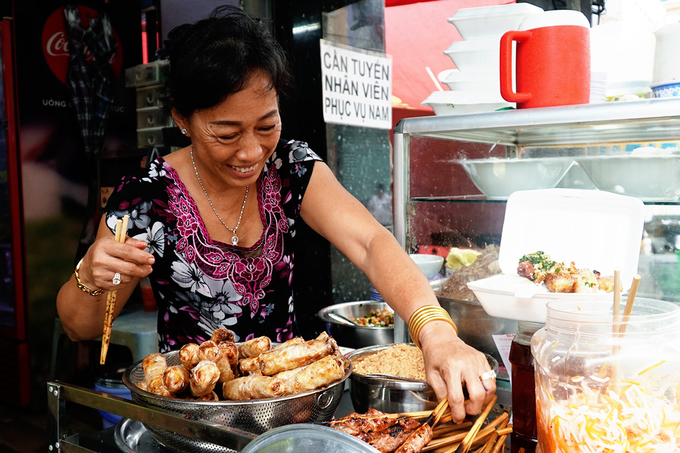 For 40 years, this eatery has stood in the center of the city on Co Giang Street. The owner started out as a street vendor, too. This eatery is frequented by many tourists, including foreigners. 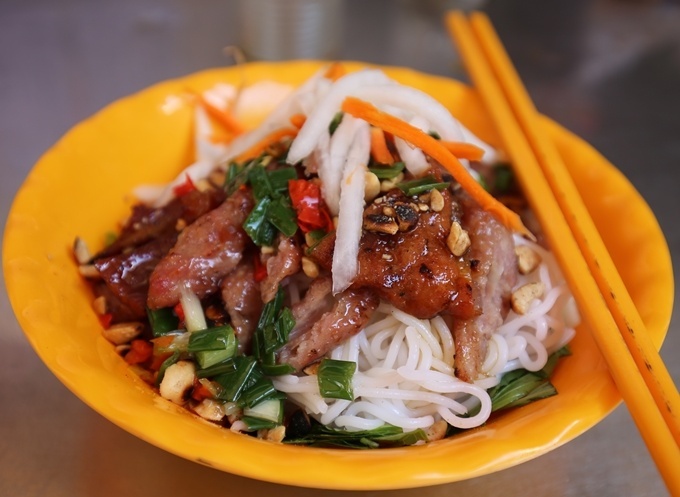 What makes this restaurant different from others is that it adds stir-fried beef to the grilled pork with vermicelli noodles. The meat is cooked to medium, and it’s soft and fragrant. 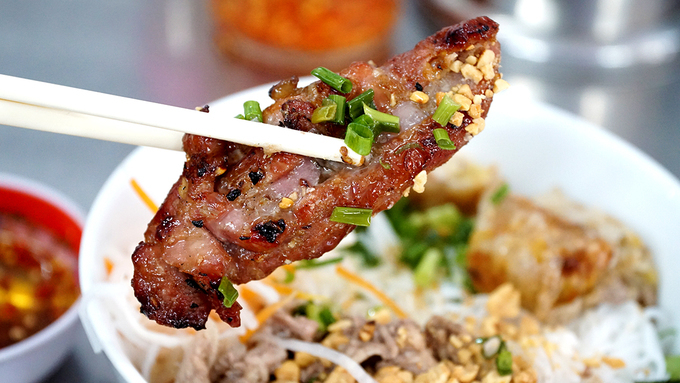 The eatery uses medium-fat meat for the grilled pork so that the finished product is not dry. Based on the traditional recipe, pork is marinated with spices for 3 hours. A serving costs VND47,000 ($2.02). This eatery in To Hien Thanh Street runs out of seats at rush hour. 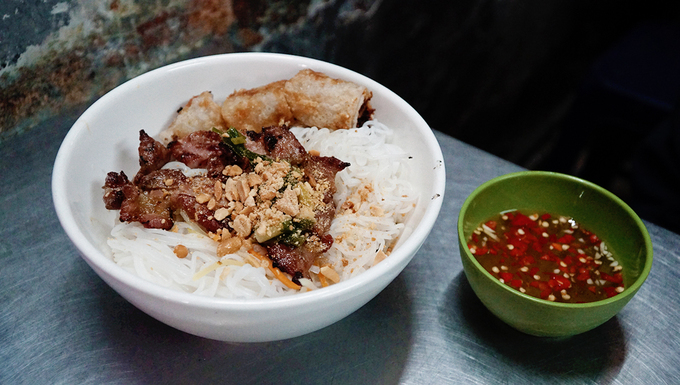 It serves a bowl full of grilled pork and spring rolls covered with a layer of fat, onions, peanuts, and pickled mustard greens. The bottom layer of fresh vegetables, the aroma of grilled pork, the crispness of spring rolls makes the dish delicious. Each serving costs VND30,000 ($1.29). With no specific sign or address, this eatery is located in one corner of the market. 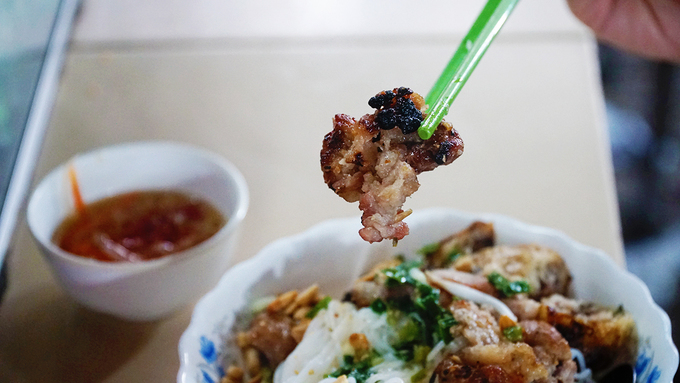 You can find it by asking local people about the grilled pork noodle stall near the used goods shop. Because of its limited space, the owner often has to “borrow” tables and chairs from the coffeeshop next door to seat customers. This eatery is only open for lunch and closes around 2 p.m. A serving costs VND30,000 ($1.29). The grilled pork and spring rolls are cooked to medium and soft. The fish sauce is moderately sweet and sour. Interested customers can observe firsthand the process of preparing and grilling pork.